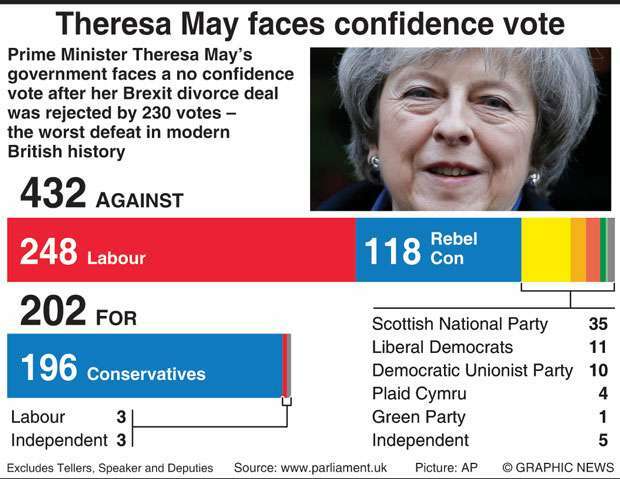 British Prime Minister Theresa May was expected to win a confidence vote on Wednesday despite a crushing defeat over her Brexit deal with the EU that triggered warnings of a chaotic “no-deal” divorce. MPs on Tuesday rejected May’s deal on leaving the European Union, leaving the Brexit process in total disarray with just 73 days to go before the official departure date. These would seem to rule out membership of a customs union or the EU’s single market, which the main opposition Labour party wants. May appeared to hint at the possibility of delaying Brexit, saying the EU would allow this “if it was clear that there was a plan towards moving towards an agreed deal”.